Calgary, Canada — Blackline Safety Corp. (TSXV: BLN) announces today that it has entered the turnarounds and shutdowns industry with its award-winning connected safety technology. Partnering with Bravo Target Safety based in Calgary, Blackline’s new G7c wireless gas detection and lone worker safety monitoring device will bring increased safety and efficiency to the turnarounds, shutdowns and outages industry. From its seven locations in Alberta, Bravo Target Safety serves clients in the energy, chemical, mining and construction industries across Western Canada. Many industries require periodic maintenance to ensure that ongoing operations are productive, reliable and safe. Turnarounds, shutdowns and outages are intensive programs that require highly coordinated work from several teams of contractors while keeping the overall project duration to a minimum. In many cases, the opportunity cost of maintenance programs is measured as tens of thousands of dollars per hour of lost revenue during the scheduled downtime. “Beyond the potential to save lives, G7c generates a wealth of data for analysis. For example, it reports the location of low level gas readings to the Blackline portal, which traditional monitors failed to capture. This information enables decision-makers to quickly see where leaks may be occurring, highlighting the need for remediation. With this intelligence, our clients may pre-empt hazards and avoid unnecessary expenditures — or worse — inadvertent employee exposures. We’re working with Blackline because we need the best wearable safety technology to protect our people while generating powerful business intelligence for our customers,” concludes Mr. O’Brien. In a first phase, Bravo Target Safety is deploying 250 G7c devices to protect personnel. Previously, gas detection was limited to simple monitoring devices with basic capabilities. With G7c, workers will benefit from real-time safety features including two-way communications, gas alarms, fall detection, no-motion detection, scheduled check-ins, GPS location technology and a manual SOS latch. In addition to these life-saving features, G7c technology helps Bravo Target Safety work more efficiently. 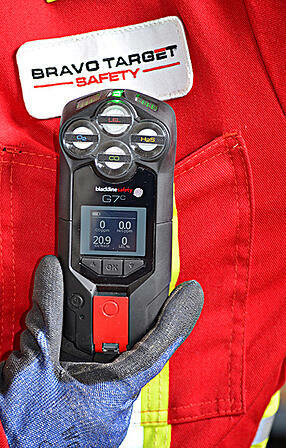 Blackline’s G7c device automatically detects falls, man-down (motionless) events, health incidents and gas leaks. It notifies a live monitoring team in real-time, empowering an immediate emergency response to the employee’s exact location. For the first time, businesses can take control of their emergency response time — down to the second — that is fully accountable and documented for future reporting. G7c incorporates 3G cellular communications, advanced location technology and provides leading environmental gas detection through the industry’s only plug-and-play gas sensor cartridges. Field-replaceable and changed in seconds, G7 cartridges provide customization to meet diverse customer requirements while eliminating downtime due to a failed sensor. Blackline Safety was recognized as Manufacturer of the Year at the 2018 Oil & Gas Awards and G7c received New Product of the Year, Internet of Things from OH&S Magazine in the United States. To learn about Blackline Safety, visit www.blacklinesafety.com and follow on Twitter @blacklinesafety. About Bravo Target Safety: Bravo Target Safety is a leading provider of industrial and oilfield emergency response and safety services. Dedicated to the highest industry standards, Bravo Target Safety selects the strongest leaders, provides the best training and invests in the best technology and equipment. Headquartered in Lloydminster, Bravo Target Safety has facilities in Bonnyville, Calgary, Edmonton, Fort McMurray, Grande Prairie and Red Deer. For more information, please visit bravotarget.ca. About Blackline Safety: Blackline Safety is a global connected safety technology leader. Providing comprehensive live-monitoring and wireless gas detection, we help teams working in hazardous environments respond to emergencies in real-time and manage efficient evacuations, accounting for everyone’s safety along the way. With millions invested in technology research and development, Blackline Safety is recognized for quality and innovation. Our talented team of designers and engineers create and manufacture in-house — from wearable technology and personal gas detectors to cloud-hosted infrastructure and web-based interfaces for global industry. We deliver the world’s first turn-key, work-anywhere connected safety monitoring solution with gas detection, 3G wireless, satellite communications, two-way speakerphone, employee messaging and live monitoring to meet the demanding safety challenges of organizations in over 100 countries. For more information, visit www.BlacklineSafety.com.